now here's an outfit that has a lot of thought put into it, though it might not really show. i was really striving to create a fun, colored outfit that would be great for work and that could be used for evening too. i managed to avoid any dark colors, especially black and this is what i came up with. i knew i wanted to experiment a bit with green, just because i don't wear it that much and i focused mostly on accessories. the green tights were the starting point and then i got all carried away with things like the green belt, the green bracelets, and green earrings. i like going matchy-matchy sometimes. 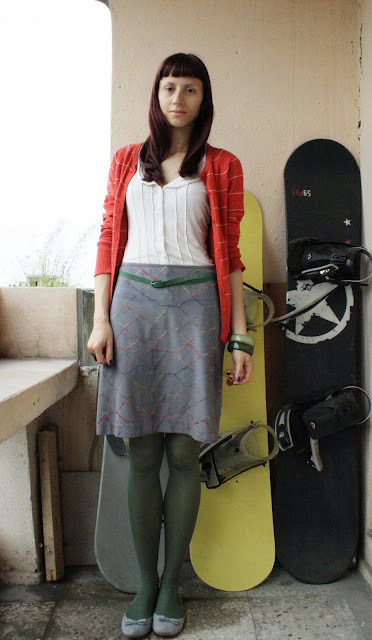 the skirt has multicolored stitchings and is so versatile, as it can be paired with so many colored tights and tops. plus it's made of the softest material ever. it always gets a lot of attention from the girls at work. and then I pulled out my favorite pair of flats, they're really soft and light and they're made out of some sort of sweatpants material. This is a great look. So calm and chic. Really suits you (for some reason I imagine you to be a very calm person!). That second photo is just beautiful. ps. 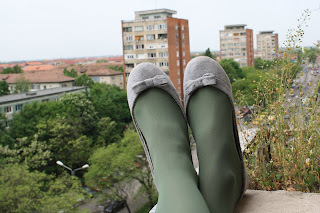 do you want to be my "blog obsession of the moment?" I would LOVE it if you would be! I really love the green added to it! Perfect shades! First off, I saw your title and I knew I would like this blog. And I did, it's so pretty. I love your style, you didn't go over the top with the matchy-matchy with the green. Now if it was a neon color, that would have been over the top. Pretty look! You made those tights not look dull but elegant, great job!